Recently I reviewed an outstanding CD of Christmas music by this same Boston-based choir. . Now a slightly earlier disc has come my way and it�s just as fine. I�m not quite sure of the target market for this disc. Is it the established collector, who may well have other versions of most or all of the pieces offered here? 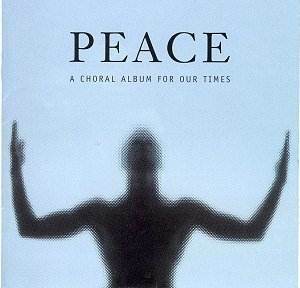 Or is it aimed at the general buyer who may be attracted by the concept of "peaceful" music? I ask the question for two reasons. Firstly, if the disc is aimed at impulse purchasers then the complexities of Schoenberg�s Friede auf Erden may come as something of a shock. More seriously, however, why put out a disc like this without a single word about the music itself in the booklet? The purchaser who doesn�t know about some or all of the pieces may be all at sea. Some collectors, like me, will have at least some of the pieces on other CDs but why should one have the inconvenience of looking elsewhere if, say, one wants to find out something about the aforementioned piece by Schoenberg? I think it�s quite important to tell listeners the date of composition of a piece, for example, or that the Rachmaninov item is not a free-standing work but a movement, the third, from a larger work, his All Night Vigil (or Vespers), Op. 37. These things matter and I�m afraid Avie get a black mark for this omission. And while I�m finding fault, it does seem a bit perverse to provide biographical notes about the artists and a history of the choir in French and German as well as in English but then only to give an English translation of the sung texts. Thankfully, that�s all there is to complain about. The music is, with one notable exception, first rate, provided one doesn�t object to a diet of strictly slow music, and the performances are in the same first rate league. Victoria�s wondrously pure polyphony is beautifully sung, the choir displaying exemplary control and clarity. Randall Thompson�s lovely Alleluia is also done very well, the performance rising to an ecstatic climax. Has anyone else composed such a memorable choral work setting just one word, I wonder? The other two American works fare equally well. Personally, I prefer Barber�s piece either in its original string quartet form or in the first arrangement that he made, for string orchestra. Human voices can�t achieve, even at their best, the same saturation of texture that strings can provide and at times the tessitura is cruel, especially for the sopranos. However, the Handel and Haydn Society Chorus cope splendidly, as you�d expect from a group of professional singers. Their account of Lauridsen�s O magnum Mysterium is one of the more spacious that I�ve heard - Grant Llewellyn does seem to have a predilection for expansive speeds in slow music � but it�s sustained superbly. This rapt piece expresses marvellously the wonder of the Incarnation and it�s very pleasing to hear it as well done as it is here. The fearsome difficulties of Schoenberg�s Friede auf Erden present a huge challenge to any choir essaying it. These singers seem to take it all in their stride and they give a lucid and committed account of it. They are also successful in the Górecki item. Arguably this piece is over long but it here receives the disciplined control of tone and dynamics that are essential for a successful performance. The same comments apply to equally satisfying accounts of the music by Rachmaninov and Tavener. The disc closes with two English items. The wordless chorus by Delius seems a bit incongruous here since it is the only secular piece on the disc. No reservations about the performance, however. I wish I could be as enthusiastic, or indeed enthusiastic at all, about the final item, a choral arrangement by someone called John Cameron (no details in the booklet) of �Nimrod� from Elgar�s �Enigma� Variations. I�m sorry, but this just won�t do at all. In the first place, as my colleague, Gwyn Parry-Jones, very rightly pointed out, the words don�t fit properly. But I think it goes deeper than that. Mr. Cameron has taken it upon himself to bring together Elgar�s sublime music and the words �Lux Aeterna luceat eis� from the Mass for the Dead. He may think Elgar�s music fits these words (it doesn�t) or suits them but in the latter case he�s quite wrong. �Nimrod� has come to be taken by many people as an elegy, connected with mourning but it�s nothing of the sort. Elgar conceived it as a tribute to his great friend, Jaeger, but Jaeger was very much alive at the time and his sudden and premature death didn�t occur for another decade! So this arrangement is completely wrong-headed and I�m afraid I think it makes a very unsatisfactory end to what is otherwise an excellent and dignified recital. I mustn�t end on a sour note, however, for this is in every other respect a first class programme, splendidly executed and presented in fine, clear sound. I enjoyed the disc very much indeed. It�s highly recommendable and will, I think, give much pleasure. Taken with the other disc, mentioned above, this CD confirms the very high standard of the Handel and Haydn Society Chorus under Grant Llewellyn. All I can say is Lucky Boston!